Cut some pieces of nylon netting (illusion or tulle) about 15 inches/40 centimeters by 36 inches/1 meter. Along one of the short edges, place 2 or 3 locks of wool taken from your fleece, tip to tip, about 1 inch/3 centimeters from the edge. Tie another string loosely around the 'sausage' where the tips of the locks meet--one time in the center if you're laying two locks end to end, two times, dividing the sausage in thirds, if you have three locks end to end. You may now wash this wool in very hot water, or even dye it using immersion or microwave techniques, without having to worry about felting or waste due to the locks becoming disarranged. The nylon netting will not be melted or otherwise harmed by boiling water temperatueres. When you're done, just drain or spin out the excess water, hang or lay out to dry, cut the strings, and unroll the wool. 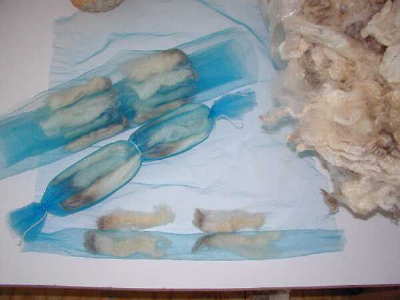 The washed or dyed wool is ready to comb as soon as it dries.